But alas, it is not over me. Well. Actually, it is over me. Hanging over me. Like the sword of Damocles. Ya know, I’m, like, an artist and some junk? Uh…housework messes up my chi? Y’all know what’s really eating me, right? That’s right. I have had NO time for knitting for, like, THREE DAYS! Except that I did finish this. It’s a Christmas stocking! Only Halloween-y! I know. I’m not sure why either. Except that it tickled me, and also it kept me busy at the fair last weekend – which kept me from getting too antsy about how not-busy I was. I think my favorite part is this i-cord braid around the top. 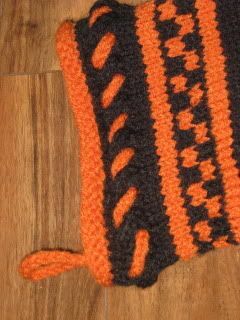 I saw something similar someplace on something (I know, I am soooooo specific), and as the whole project I kind of made up as I went along – well, I sort of made up a way to do this i-cord as well: One row of K2tog, yo…second row plain knit…third row K2tog, yo. Then, make two i-cord braids long enough to lace all the way around the band. Put it through the top one, skip to the kitty-corner bottom one, and back up to the top – skip one hole, put it through the next one. Then do the same thing with the alternate color. Ta-da! The only thing I’d do differently another time would be to use three colors for this band – so that there’s more contrast between background and braid. 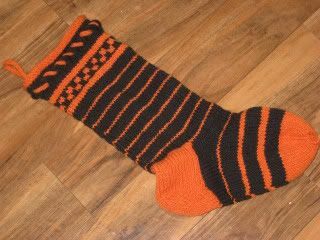 Unfortunately, finishing this didn’t mean I actually had time to sit down and knit anything – I was all done except for grafting the toe, running in ends, and braiding the i-cord through the holes. Which took all of fifteen minutes, and it aggravates me how hard it was to get that fifteen minutes together. I hate housework. I hate it so much. And I rather resent the way it just keeps needing to be done, no matter how many times you’ve done it in the past. Also the way it punishes you for not doing it by taking three times as long if you’ve given it a miss for a week or two. Right! Glad we had this little chat! And now, I have to go finish (by which I mean start) cleaning the front room. The husband is having his quartet come here for rehearsal tonight, even though the whole of the Den is pretty much a shameful sight that should be kept completely secret from the world. You have my deepest sympathy. Housework stinks. Period.